Its 12th November ... Yes dear readers, celebrations at Flavor and Colors ! It was exactly 12 months back I clicked the "Publish" tab for the first blogpost and today this space is one year old. Not sure of how and what exactly I was going to do, I just commenced on this journey carrying a hope to experiment with my clicks, cook more recipes, gain knowledge about how blogging works, and mostly to know and interact with new friends who share the same passion. Can't believe how fast time has flown by, but it surely has shaped Flavors and Colors to the present form. It has been an amazing year getting to know so many talented, creative friends and foodie bloggers all around. Looking back, I feel proud to see the successful culinary experiments from my kitchen [more dishes were cooked and baked last year than ever before]. Learning about the developer's tools hidden in the browser to manipulate the look of the blog [a bit of CSS, html coding] was something which I wouldn't have dared if I was not blogging. Those tons of food clicks and offline articles on photography [my laptop hard drive is burdened with food photos and its shouting for a cleanup :P] helped me to explore my DSLR settings and at the same time understand food on the plate from an aesthetic perspective. 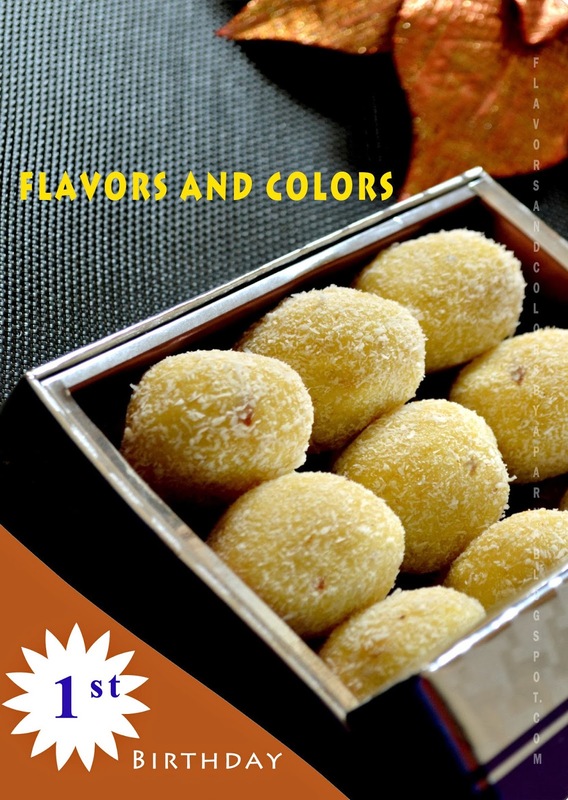 So, I am here to celebrate this special occasion and share the recipe of laddoo, a popular Indian sweet. 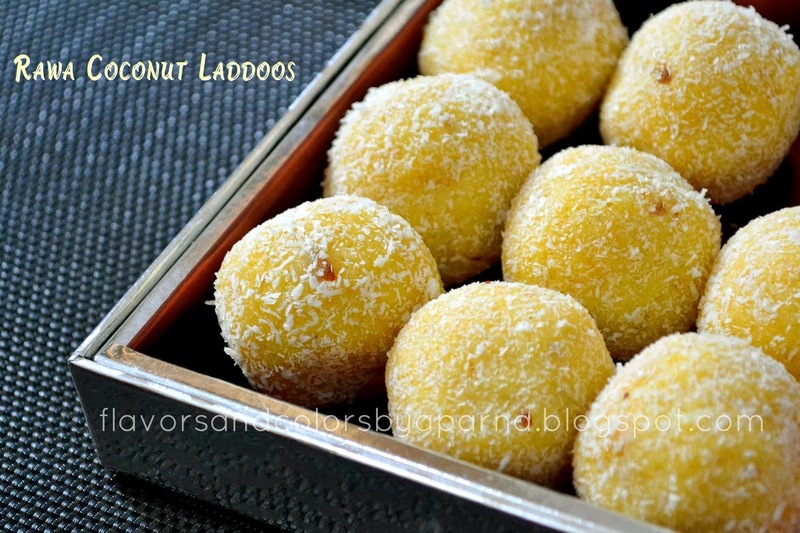 Usually laddoos are made with sugar syrup but this recipe uses condensed milk. Thus, it is an easier and faster way when compared to regular sugar syrup method of preparing laddoos. Switch off the flame. Add the saffron soaked milk gradually to the mixture. Mix well and cover the vessel with a lid. Let it rest for 5-10 minutes till the mixture absorbs the milk. When the mixture is warm enough to handle, pinch out a small portion and roll it into laddoo shape. Repeat the process till you finish with the mixture. Take the dessicated coconut in a plate, roll the laddoos one by one and coat them well. Store in air-tight containers and consume them in 2-3 days. You can store them upto a week in refrigerator. This journey has been a fun ride. What began as love for photography, it helped me to explore my other interests as well - cooking, presenting and writing :) . I take this opportunity to thank all my friends who happily shared their recipes with me. I would like to thank all my readers too, for visiting this space and leaving your feedback which has really encouraged and motivated me to progress so far. Hope you continue to support me, and next year brings in more learning, more clicks on manual mode, more recipes and more fun along with it. Happy Cooking and Clicking !